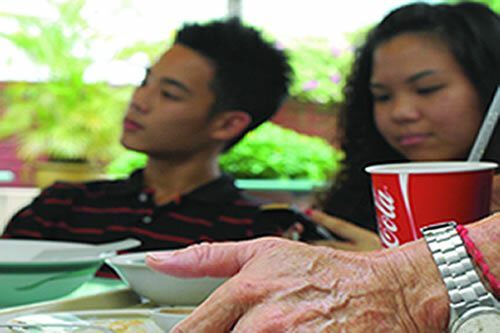 With more elderly folk dominating ‘the clean scene’, SHEEREEN TEO believes that it’s time to start reminding one another to “clean up” after ourselves. Let’s face it: We’ve all been on the receiving end of the tirade of dissatisfaction heaped upon us from our elders especially when it comes to cleaning up. The phrase “You young people these days ah!” would probably sound familiar to most of us. And they probably would have every right to make such a comment. Why? Because our current generation have turned into brats who need to be reminded about the basics of helping to keep the environment clean and to clean up after themselves. A quick check with all the local polytechnics reveals that four out of the six schools employ janitors and cleaners, a large majority who are above the age of 55 years old. The practice of returning one’s cutlery and playing a part in keeping the school clean has more or less been abandoned because of the steady supply of cleaners who keep our school’s surroundings clean. According to Mdm Kalarani, she has “cleaned everything from vomit to used sanitary pads to bloodstains to rotting leftover food”. Sadly, she has never seen an increase in her pay. In fact, she adds that with the recent inflation, she has had to scrimp and save even more. Nur Liyana Ya’acob, 19, a final year student from Singapore Polytechnic confesses that she feels “sinful and guilty” when she sees elderly cleaners, “especially those who can barely walk straight” struggling to perform their cleaning duties. However, she believes that some of them choose to take up such jobs out of their own free will. Some youths, like Esther Teo, 20, a first year National University of Singapore student, echoes Nur Liyana’s sentiments and readily admits that today’s youths “have it much easier than our elders”. Much depends on the role models young people here, it seems. Mdm Hapifah Bte Arshad, 54, a cashier at a local convenience store, believes that parents should set good examples so that their children will learn the right things. “Manners matter. If your children see you saying ‘thank you’ after a cleaner has cleaned your table, they will naturally follow. It’s important to remember that children mimic parents’ behaviour”. Mrs Pamela Tay, 58, a nurse, hopes that youths will be more appreciative and thankful towards our cleaners. “Singapore owes its ‘Clean and Green City’ title to them.